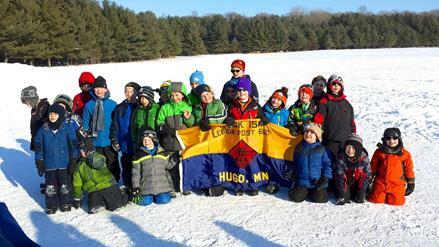 Lions, Tigers, Wolves, Bears and Webelos can get outside this winter and experience the magic of Polar Cubs day camp. This is a one-day experience filled with fun, adventure, winter activities and advancement opportunities. Registrations submitted by Jan. 1 are elligible to use any available individual Scout Account (fundrasing) funds or pay by check. Signing yourself up is easy through the Northern Star Council's Polar Cubs Registration page. Age-appropriate activities may include snow-tubing, broomball, obstacle course, winter nature activities, indoor crafts, field games, outdoor skills, skits and much more. Webelos have the opportunity to participate in a special Webelos program, designed just for them to learn about winter survival, animals and outdoor sports. A hot lunch is provided in the camp dining hall for everyone. Scouts and parents will learn how to keep warm and stay dry in the snow and cold. Siblings: Sorry, only BSA registered youth may attend. Your scouts fundraising dollars (known as his Scout Account) are avaialable for this camp experience. Be prepared to write a check if there isn't a sufficient balance to cover the entire cost. Final deadline is January 1. First come, first served. Drop off registration form and payment to the Cub Scout drop box on Outings Chair's front porch at 4545 Garden Way N.
At camp, each participant must turn in their own Annual Health & Medical Record at the camp's registration desk. *In the case of adversely cold weather we will adjust the program to allow for additional indoor actvities. Is encouraged for all Cubs and Webelos. Lion and Tiger Cubs are required to attend with an adult partner. (1:1 ratio of youth to adult). This is a mostly outdoor camp experience. Dress in layers and be prepared for the weather. Visit this page for advice. Each Cub Scout and adult must have proper winter outdoor clothing including snow suits/pants, boots, hats and 2 pair of mittens. Withdrawing after registering & no-shows: All registrations are subject to Pack 151's Outings Policy. Weather Cancellations: Polar Cubs is a Northern Star Council sponsored event. Decisions for official camp closing will be made by the Council's Camping Director. When camps are officially closed, fees may be transferred to another weekend within the Council's Polar Cubs season. More often than not, the Director will not close the camp. If conditions are deemed to be unsafe a cancellation will be communicated by the Council office prior to the event. Pack 151 believes every boy should have the opportunity to experience the excitement of camping, and wants to provide the opportunity for registered boys to go to camp. These experiences help boys learn new skills and advance through the ranks of Scouting. The intent of camperships is to ensure that any boy with financial difficulties is not denied the opportunity to attend camping programs. Contact our Pack Committee Chair or our Pack Outings Chair for more info.